"Apologist" redirects here. For non-religious uses of "Apologetic" and "Apologist", see Apology (disambiguation). Apologetics (from Greek ἀπολογία, "speaking in defense") is the theological science or religious discipline of defending or proving the truth of religious doctrines through systematic argumentation and discourse. Early Christian writers (c. 120–220) who defended their beliefs against critics and recommended their faith to outsiders were called Christian apologists. In 21st century usage, 'apologetics' is often identified with debates over religion and theology. It may be less frequently heard in the UK (although the related word 'apologist' is used in a non-religious sense). The term "apologetics" derives from the Ancient Greek word apologia. In the Classical Greek legal system, two key technical terms were employed: the prosecution delivered the kategoria (κατηγορία), and the defendant replied with an apologia. To deliver an apologia meant making a formal speech or giving an explanation to reply and rebut the charges, as in the case of Socrates' Apologia defense, as chronicled in Plato's Apology (the defense speech of Socrates at his trial). This term appears in the Koine Greek of the New Testament. The Apostle Paul employs the term apologia in his trial speech to Festus and Agrippa when he says "I make my defense" in Acts 26:2. A cognate form appears in Paul's Letter to the Philippians as he is "defending the gospel" in Philippians 1:7, and in "giving an answer" in 1 Peter 3:15. Although the term 'apologetics' has Western, primarily Christian origins and is most frequently associated with the defense of Christianity, the term is sometimes used referring to the defense of any religion in formal debate involving religion, including religious philosophies such as atheism, secularism, humanism, agnosticism, and scientism. One of the earliest Buddhist apologetic texts is The Questions of King Milinda, which deals with the Buddhist metaphysics such as the `no-self' nature of the individual and characteristics such as of wisdom, perception, volition, feeling, consciousness and the soul. In the mid-19th century, encounters between Buddhists and Christians in Japan prompted the formation of a Buddhist Propagation Society . In recent times, A. L. De Silva, an Australian convert to Buddhism, has written a book, Beyond Belief, providing Buddhist apologetic responses and a critique of Christian Fundamentalist doctrine. Gunapala Dharmasiri wrote an apologetic critique of the Christian concept of God from a Theravadan Buddhist perspective. 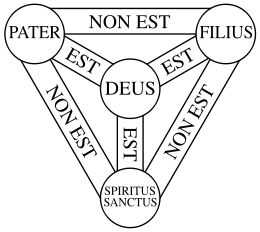 The Scutum Fidei, a diagram frequently used by Christian apologists to explain the Trinity. Later apologists have focused on providing reasons to accept various aspects of Christian belief. Christian apologists of many traditions, in common with Jews, Muslims, and some others, argue for the existence of a unique and personal God. Theodicy is one important aspect of such arguments, and Alvin Plantinga's arguments have been highly influential in this area. Many prominent Christian apologists are scholarly philosophers or theologians, frequently with additional doctoral work in physics, cosmology, comparative religions, or other fields. Others take a more popular or pastoral approach. Some prominent modern apologists are Douglas Groothuis, Frederick Copleston, John Lennox, Walter R. Martin, Dinesh D'Souza, Douglas Wilson, Cornelius Van Til, Gordon Clark, Francis Schaeffer, Greg Bahnsen, Edward John Carnell, James White, Hank Hanegraaff, Ravi Zacharias, Alister McGrath, Lee Strobel, Josh McDowell, Peter Kreeft, G. K. Chesterton, C. S. Lewis, William Lane Craig, J. P. Moreland, Hugh Ross, David Bentley Hart, Gary Habermas, Norman Geisler and Scott Hahn. Christian apologists employ a variety of philosophical and formal approaches, including ontological, cosmological, and teleological arguments. Many Christian apologists also note, however, that the Gospel is the best defense and living a life according to the tenets of Jesus' teachings is the best argument. Several well-known Mormon apologetic organizations, such as the Foundation for Ancient Research and Mormon Studies (a group of scholars at Brigham Young University) and the Foundation for Apologetic Information & Research (an independent, Mormon-run, not-for-profit group), have been formed to defend the doctrines and history of the Latter Day Saint movement in general and The Church of Jesus Christ of Latter-day Saints in particular. Notable apologists within the Catholic Church include Bishop Robert Barron, G. K. Chesterton, Dr. Scott Hahn, Patrick Madrid, Kenneth Hensley, Karl Keating, Ronald Knox, Peter Kreeft, and Gus Loyd. Topics regarding Catholic history and doctrine presented by apologists and various lecturers are published and available for download. A Catholic apologetics website is Catholic Answers. Hindu apologetics began developing during the British colonial period. A number of Indian intellectuals had become critical of the British tendency to devalue the Hindu religious tradition. As a result these Indian intellectuals, as well as a handful of British Indologists, were galvanized to examine the roots of the religion as well as to study its vast arcana and corpus in an analytical fashion. This endeavor drove the deciphering and preservation of Sanskrit. Many translations of Hindu texts were produced which made them accessible to a broader reading audience. Jewish apologetic literature can be traced back as far as Aristobulus of Paneas, though some discern it in the works of Demetrius the chronographer (3rd century BCE) traces of the style of 'questions' and 'solutions' typical of the genre. Aristobulus was a Jewish philosopher of Alexandria and the author of an apologetic work addressed to Ptolemy VI Philometor. Josephus's Contra Apion is a wide-ranging defense of Judaism against many charges laid against Judaism at that time, as too are some of the works of Philo of Alexandria. 1 2 "ἀπολογία". Blue Letter Bible-Lexicon. Retrieved 19 September 2016. ↑ "Apologetics". The Advent. Retrieved 24 September 2016. ↑ "apologetics". Merriam-Webster Dictionary. Retrieved 5 October 2016. ↑ "Acts 26:2". Blue Letter Bible. 19 September 2016. ↑ "Phl 1:7". Blue Letter Bible. 19 September 2016. ↑ "1Pe 3:15". Blue Letter Bible. 19 September 2016. ↑ Smith, Peter (2000). "apologetics". A concise encyclopedia of the Bahá'í Faith. Oxford: Oneworld Publications. pp. 39–40. ISBN 1-85168-184-1. ↑ "Making the Crooked Straight, by Udo Schaefer, Nicola Towfigh, and Ulrich Gollmer". bahai-library.com. ↑ De Silva, A. L. (1994). Beyond Belief, a Buddhist Critique of Fundamentalist Christianity (PDF). Three Gems Publications, ebook link at Buddha Dharma Education Association Incorporated, also. ISBN 978-0-6462-1211-1. ↑ Dharmasiri, Gunapala (1974). A Buddhist critique of the Christian concept of God : a critique of the concept of God in contemporary Christian theology and philosophy of religion from the point of view of early Buddhism. Colombo : Lake House Investments – via WorldCat. ↑ Brent, James. "Natural Theology". Internet Encyclopedia of Philosophy. Retrieved 10 March 2015. ↑ J. David Cassel. "Defending the Cannibals: How Christians responded to the sometimes strange accusations of their critics." "Archived copy". Archived from the original on 2011-08-21. Retrieved 2012-09-08. ↑ "Why Early Christians Were Despised". Christianity Today (Church history timeline). Retrieved 21 September 2016. ↑ Catholic Education Resource Center: The Scott Hahn Conversion Story Archived July 18, 2012, at the Wayback Machine. ↑ Coulter, Paul. "An Introduction to Christian Apologetics". Bethinking. Retrieved 21 September 2016. ↑ "Page Not Found - Word On Fire". ↑ Chesterton, G K (2008). The Everlasting Man. Radford: Wilder Publications. p. 180. ISBN 160459246X. ↑ "Kenneth Hensley - Catholic Apologetics Academy". ↑ "APOLOGISTS". Jewish Encyclopedia. 1906. ↑ Simon Schoon, "Noachides and Converts to Judaism", in Jan N. Bremmer, Wout Jac. van Bekkum, Arie L. Molendijk. Cultures of Conversions, Peeters Publishers, 2006, ISBN 978-90-429-1753-8, p. 125. ↑ About Us, Outreach Judaism website. Accessed January 9, 2011. ↑ J. Gordon Melton, "The Modern Anti-Cult Movement in Historical Perspective", in Jeffrey Kaplan, Heléne Lööw. The Cultic Milieu: Oppositional Subcultures in an Age of Globalization, Rowman Altamira, 2002, ISBN 978-0-7591-0204-0, p. 285, note 4. ↑ "The Pantheist Credo". World Pantheist Movement. ↑ "Red Jacket on the Religion of the White Man and the Red by Red Jacket. America: I. (1761-1837). Vol. VIII. Bryan, William Jennings, ed. 1906. The World's Famous Orations". bartleby.com. ↑ "Apology". Britannica Academic Edition. Encyclopædia Britannica. Retrieved 14 July 2011.